Bali has become an almost exclusively tourism-driven island. While that tourism is successful, at some point Balinese authorities will have to draw a line as the Hindu culture of the Balinese people that makes the island so compelling has begun to chafe under the burden of so many visitors. Despite that, the island continues to entice visitors and attract hotel investment. The island still has beaches with peerless sunsets, terraced rice paddies, the ubiquitous creativity of the Balinese people and there are all those temples scattered about the island. It also has the new toll road and underpass linking Nusa Dua-Benoa and Ngurah Rai International Airport, and an airport upgraded so that it can receive up to 25 million passengers per year. The toll road reduced traveling time from Sanur to Nusa Dua from one hour to six minutes. The island keeps adding hotels even as its existing hotels continue to evolve new product to attract new markets. Bali also offers a fine selection of hotels and resorts and recently a few more have joined the inventory. In August, the Centara Grand Villas Nusa Dua Bali, the first five-star villa resort opened on the Nusa Dua Peninsula on Bali’s southern tip. Two signature restaurants, a bar, a pool, the executive club lounge, spa and a fitness center are joined by 14 independent villas offering a choice of one, two or three bedrooms and set in an extensive garden area. The villas are designed in Peranakan style with spacious interiors of 225 square meters, each sporting marble floors and teak and rosewood furnishings. 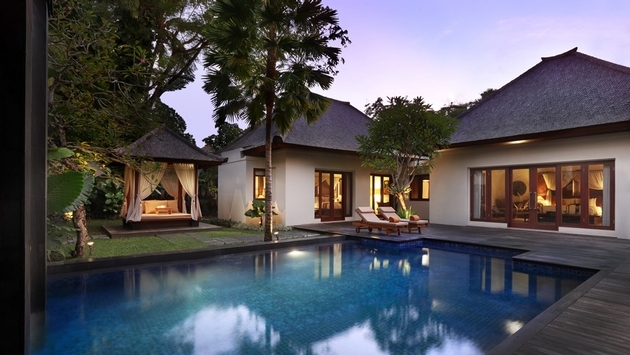 Each villa has its own pool complete with sundeck and pool shower, and a living and dining area flanked by a garden. The two bedroom luxury pool villas work for families or groups of up to four adults and three children in a minimum of 350 square meters of total space. The three-bedroom luxury pool villas provides over 680 square meters and are good for up to six adults and two children. As a center of Balinese painting, wood carving and textiles, Ubud is an absolute must-see destination. The Solís by Capella Hotel Group will develop the Solís Ubud Resort & Spa for an opening in 2017. The Ubud property will be designed by Denton Corker Marshall, who recently completed The Stonehenge Visitor Center in England, which is getting so much media attention. And in 2016, Ubud will add a new Ritz-Carlton Reserve situated alongside the Ayung River, with views of the terraced rice paddy fields adjacent to the village temple. Jimbaran Bay hugs the west side of the isthmus that connects the Nusa Dua Peninsula to the Balinese mainland. The new 82-room U Sameera Pecatu Bali adds more five-star service to the Pecatu Indah Resort Complex, a relatively new tourism destination on a thousand acre estate. The resort has an 18-hole championship golf course, shopping malls and a convention center. Destination Asia has come up with another form of luxury with its eco-trek into the Batukaru Nature Reserve. The reserve features mammoth trees that disappear into the tropical mists above. The trek features an opportunity to take part in a ceremony performed by a local priest in a hidden jungle temple. Participants stay in the Sang Giri mountain tent resort in the mountains of Jatiluwih – a world heritage site. The resort has eight deluxe tents, complete with en suite toilets and private terraces. The RIMBA Jimbaran Bali, located near its sister property the AYANA Resort, just accentuated its appeal with a new Kids’ Club that includes an air-conditioned indoor play zone connected to the resort’s Lower Pool Waterslide by a cabana. The club has a mini-cinema room with theater-style sofa seating and a 55” television for movies, a games room with a 55” TV for Wii and PlayStation4, an indoor rope swing and soft toys, a revolving set of activities and more. The club opened in addition to the existing AYANA Kids’ Club located at nearby AYANA Resort and Spa. Guests have access to either Kids’ Club, each offering different recreation programs and facilities. On the other side of the spectrum, the Spas at Four Seasons Resorts Bali are carving a new identity with “specialist retreats” by experts. Each month, the Spas will introduce guests to their Masters in Residence at both Four Seasons Resort Bali at Jimbaran Bay and Four Seasons Resort Bali at Sayan, with programs ranging from holistic healing to traditional healthcare and acupuncture. For instance, this month features Mary Muryn, a wellness veteran to both of their Balinese resorts: the Four Seasons Resort Bali at Jimbaran Bay and the Four Seasons Resort Bali at Sayan. Other specialists coming in include Dr. John Rogersen who will emphasize In Depth Healthcare in October and Acupuncture with Nichole Dreyer in late December and early January.